An Australian farmer has spoken out after a picture of his adorable sheepdog took the internet by storm. 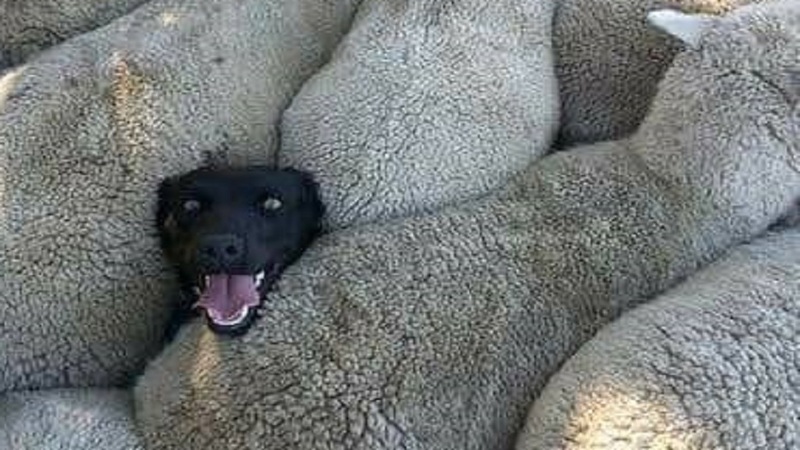 Tasmanian Charlie Mackinnon shared a photo of his black Kelpie getting herself into a spot of trouble with a flock of sheep - and social media exploded. The hilarious image shows little Izzy’s head poking out from underneath the farm animals. Mr Mackinnon was working in the sheep yard at the time his ’best dog’ got stuck. He told Daily Mail Australia: "That time she must have slipped down between [the sheep] and they jammed up pretty hard. "It was funny at the time, she enjoys what she does." The sheep farmer said Izzy gave him that look of ’I’m stuck’ but she was rescued pretty quickly. The photo was taken in 2014 when Izzy was about three-years-old and ’in her prime’. However, the working dog was tragically hit by a car when she was five-years-old. "It was horrible at the time," Mr Mackinnon said. "She was an absolute legend, worked all day. "It was a bit of a loss, she was probably my best dog at the time ... it makes life more difficult." Mr Mackinnon chose to share the image after he entered it in a sheep photo competition celebrating the work of Australian farmers. After the photo spent years on Mr Mackinnon’s fridge, it quickly went viral and received over 50,000 likes on the Farmers Guardian Facebook page. "These days we’ve always got a camera in back pocket - I thought it was worth putting in the competition," he said.